Built in the Georgian style, the Guildhall brought together Kingston's administrative functions. 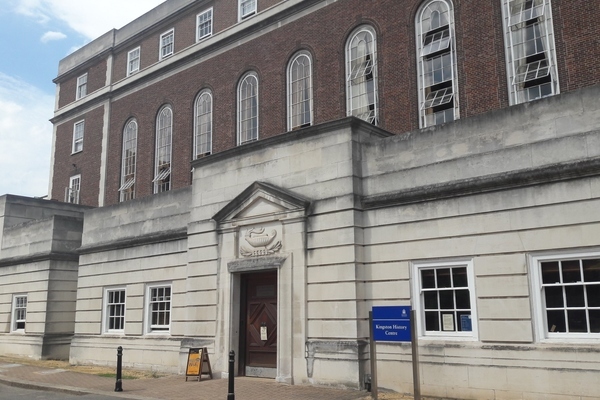 Purpose-built Magistrates Courts were included in the building, part of which are now home to Kingston History Centre. The Guildhall was built in 1934 and opened in 1935 by HRH Princess Alice Countess of Athlone (the granddaughter of Queen Victoria). The new building replaced Clattern House and the Assizes Courts which were formerly on the site and so centralised the local government of the former Royal Borough of Kingston-upon-Thames. The Fire Station, part of the original scheme, was never built. After the amalgamation of the three boroughs into the London Borough in 1965 more accommodation was necessary so Guildhalls 1 and 2 were built. 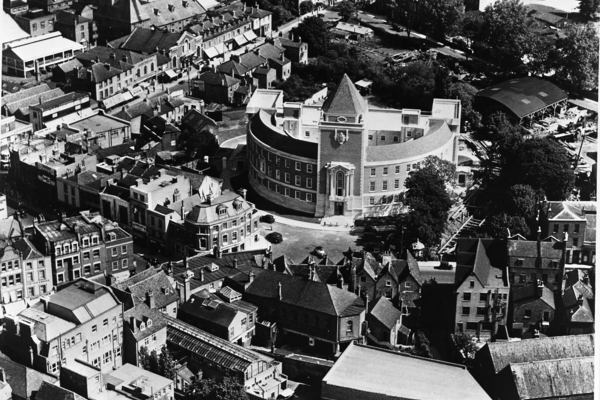 The architect was Maurice E Webb DSO MC FRIBA and he designed the D shaped building in sympathy with the style of Bentall's new department store which itself followed the style of Hampton Court. The necessary local administration offices were accommodated in the curved part of the D with the prestigious Council Chamber, Committee Rooms and Mayor's Parlour across the diameter, adjoining each other, with an adjustable sinking wall for larger or smaller areas as needed. The Magistrates Courts were on the floor below. The Guildhall was built by Gee, Walker and Slater Ltd of London and Derby. The authorities decided to use local, British and Empire sourced material. The bricks came from the Oxshott Brickworks, the tiles from the Swallow Brick and Tile Works, Cranleigh and stone detailing from Portland which was carved with emblems representing the River. In 2009 it was announced that 1 in 4 magistrates courts in London would be closed, and then it was announced that Kingston was one of those due to be closed. Despite protest from the public, council, magistrates and the press, the Magistrates Courts closed in 2011 and the fate of the space was unknown. It was later decided that the accommodation would become the new home of Registration Services and the Archive and Local History service. Due to the special character of the courts, the conversion of the space was to be accomplished through a careful restoration project guided by Historic England. Kingston History Centre opened in October 2015.